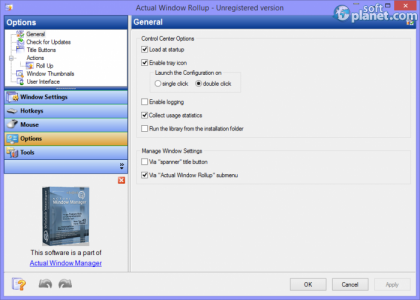 SoftPlanet makes it possible for everyone to get free Actual Window Rollup download directly from our servers. There is no registration needed for downloading. Sometimes you have to open many windows on your screen, but only one of them is active at a time. Minimizing and maximizing them is a waste of time if you have to switch from one to another. Actual Window Rollup 8.1.3 gives you a new elegant way to work with many opened windows by rolling them up to their title bars. This is possible thanks to a new feature that becomes active once you launch this app. You can set it up to start when your Windows OS starts. Although it is paid, you can download and install its 7-day free trial version. It is fully functional and is not restricted in any way. 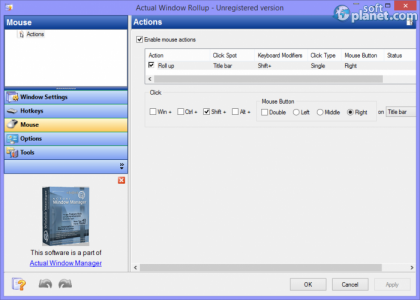 Actual Window Rollup can be controlled with a mouse or a keyboard. It rolls up your windows just like your blinds. Only their title remains on your screen, so you can quickly restore any window. The program adds a small button next to the three available title buttons. You can set the app to roll up every window if it is inactive or roll it back down when it becomes active. Otherwise, you can manually control that function via the title button, via a window menu item or by a title bar double-click action. The Actual Window Rollup icon normally sits in your taskbar and works without interfering with your tasks. 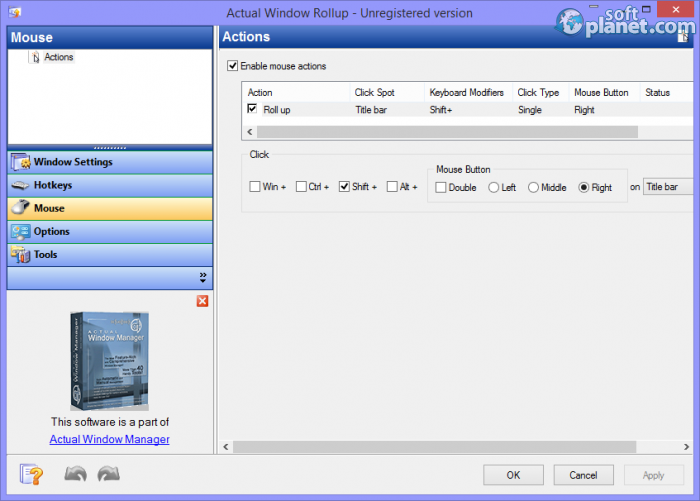 Its main window can be populated on the screen if you right click on it and choose Settings. This window can also be rolled up and down. There are five tabs to the left that are used to configure all program features and functions. All hotkeys and mouse actions can be customized from there either. The new button skin can be changed to your preferences as well as the interface language. The navigation and toolbar icon size and font are adjustable too. 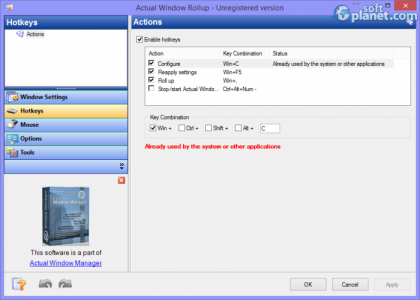 Actual Window Rollup 8.1.3 allows you to exclude certain application windows from the new feature. New window rules can be created or deleted from the specific settings tab. Even more, you can activate “Unroll while mouse-hovered” feature which will expand every window when you hover your mouse cursor over its title. 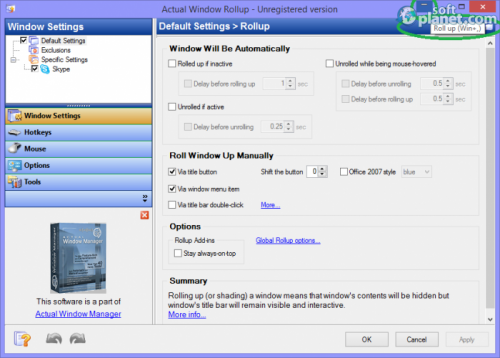 Actual Window Rollup is a small, but handy program that can become part of your Windows OS. It adds an extra button to any open window on your screen. Once you use it for a while, you may become addicted to it, so be careful. Actual Window Rollup is VIRUS-FREE! Our security scan shows that Actual Window Rollup is clean from viruses. 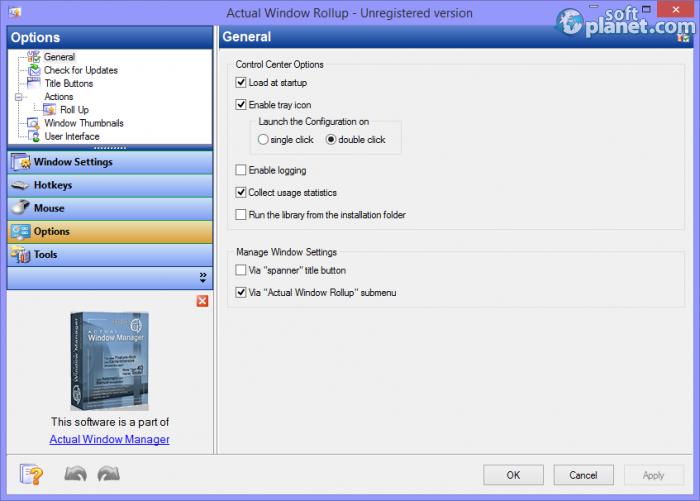 The current version of Actual Window Rollup has been scanned by our system, which contains 46 different anti-virus algorithms. 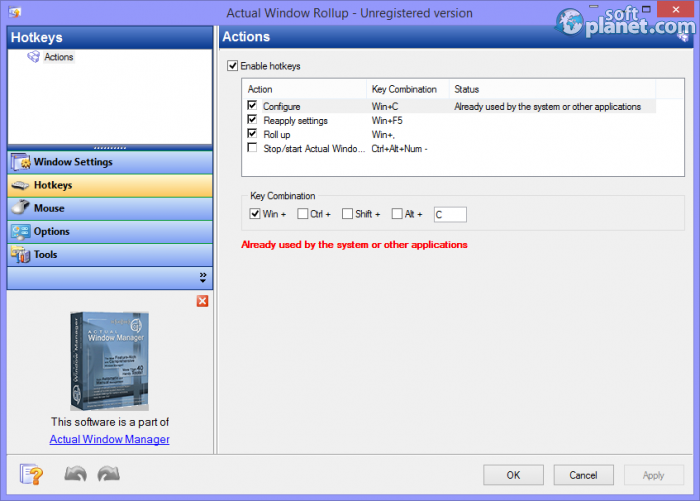 That ensures that Actual Window Rollup 8.1.3 is 100% safe for your computer.